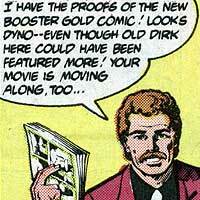 Dirk Davis is a public relations expert who became Booster Gold's manager. Dirk Davis worked hard to make Booster Gold a household name by negotiating a number of contracts with the Hollywood elite like Conrad, producer of Booster Gold: the Movie. Like Booster, Davis' motivations were frequently financial; he had his daughter, Sarah Davis, to feed and clothe. Both the 1000 (see DIRECTOR OF DEATH) and the MANHUNTERS attempted to manipulate Davis against Booster, and as a result, the two are no longer on speaking terms. Nurse Devlin is an employee of Metropolis General Hospital who helped nurse Booster Gold back to health following his final confrontation with the DIRECTOR OF DEATH. 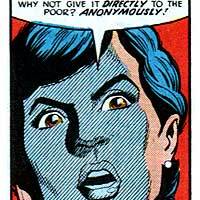 She was very critical of Booster's motivations. In fact, most of Booster Gold's encounters with medical personnel have been less than cordial. Doctor Klaus lectured Booster about his poor attitude while recovering from life threatening injuries by way of DEVASTATOR.